Eternal optimist and Top Rank boss Bob Arum likes to throw down definitive, strong statements. Because Manny Pacquiao is his biggest client, the statements are usually about him. Floyd Mayweather Jr. is Pacquiao’s biggest rival, so naturally the statements will inevitably name-drop him in some way. And, of course, they come just often enough to keep Arum’s name in the news. Why does Arum constantly make these definitive, no-wiggle room proclamations to the press? It&apos;s anyone&apos;s guess, really. Perhaps because he’s so adept at lying that he likes to create little challenges for himself? Either way, the latest fool-proof Arum-ism came during the Top Rank boss’ most recent interview with Arash Markazi of ESPN Los Angeles. "That fight will never, ever happen," Arum said. "Ever, ever happen because of Mayweather. "When Mayweather talks about how he hates Top Rank he&apos;s talking bulls---. What Mayweather hates is Manny&apos;s right hand. 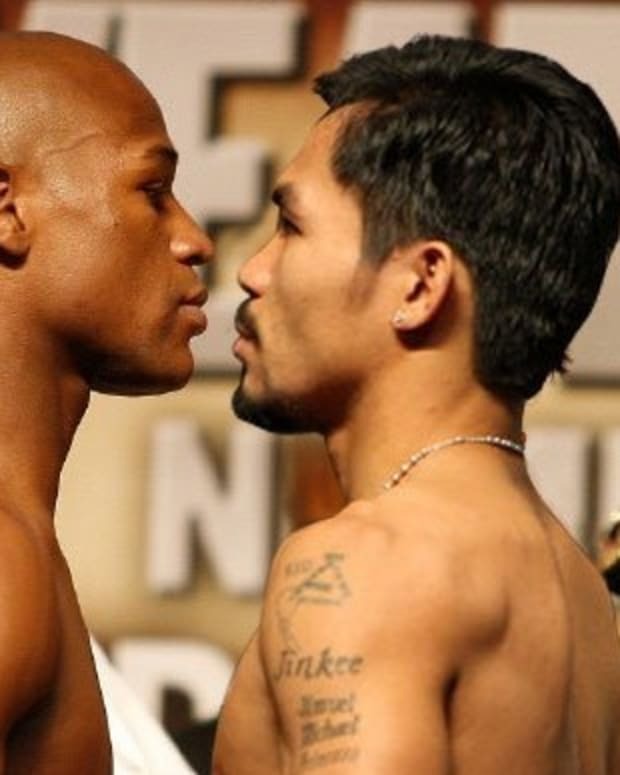 Mayweather has no chin and Manny will knock him out. Pacquiao and Mayweather is a three or four-round fight. Period. And who knows that best? Mayweather. The one thing Mayweather has had throughout his career is he knows boxing. He understands boxing and Mayweather cannot compete with Manny. It&apos;s the right hand of Manny that is preventing that fight from happening. If Manny agreed just to jab with the right hand the fight would be made in 30 seconds." "Once Manny demonstrated that fearsome right hand there was no chance ever that the fight would happen," Arum said. "None. Don&apos;t kid yourself. I know Mayweather, everything else is bulls---." Basically, to summarize Arum’s rant: Pacquiao vs. Mayweather will never happen because the latter is afraid of the right hand that the former developed two years ago. Yes, you heard that right. The same Floyd Mayweather whose cockiness, if it were a body of water, could fill up the Hoover Dam – is afraid of Pacquiao&apos;s right hand. The truth is, the only thing preventing this fight from happening is the collective stubbornness of all involved. Everyone from Pacquiao to Mayweather to Arum deserves a proportional amount of blame for how things have gone over the last two years – and the only reason they don’t get a proportional amount of blame is because folks have decided to pick sides rather than to look at it all objectively. If even Pacquiao’s trainer, Freddie Roach, isn’t fully aware of what exactly the hold-up in negotiations between the pair was, how could anyone else be? Fear not, though. Despite the fact that Arum is fear-mongering the fans into believing that a fight between Pacquiao and Mayweather is absolutely, positively out of the question – it’s really only out of the question until he feels the need to re-insert himself back into the limelight.